A few months ago I published a guide dog post featuring Georgie. 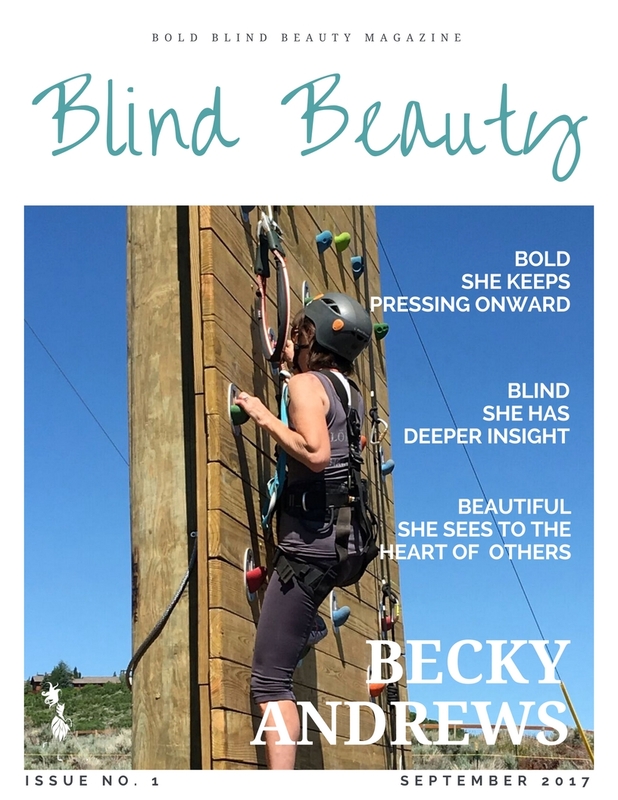 Today I am pleased to introduce you to Georgie’s handler, Becky Andrews, a phenomenal woman with an important message for everyday and especially useful during the holiday season. I am grateful to be a part of the Bold, Blind, Beautiful Community. Join us in a conversation of Self-Compassion. What? In a time of giving – do we really have time to show self-compassion? Yes! When we come from a space of authenticity and kindness to ourselves we are able to more wholeheartedly extend that love, kindness and compassion to others. Self–compassion is simply giving the same kindness to ourselves that we would give to others. Christopher Germer. It is extending compassion to one’s self in instances of perceived inadequacy, failure, or general suffering. Kristin Neff has defined self–compassion as being composed of three main components: self-kindness, common humanity, and mindfulness. Let me give you a personal example of a planned self-compassion experience: the annual visit to the ophthalmologist retinal specialist. Often this appointment can take several hours with various testing. This is an example of how I may practice the three components of self-compassion on the day of my retina appointment. Self-Kindness – I am kind to myself and make the daily schedule as simple as possible. Generally I take the day off work so that I am not concerned about the time or feel in a rush. Common Humanity – As I enter the waiting area I sense common humanity as I know there are many in the waiting area experiencing a challenging appointment. As we feel this common humanity – I am not alone – it helps us to feel compassion and connection not only to ourselves but to those around us. Mindfulness – A mindful activity for me on this day may be simply taking a few moments outside of the beautiful Moran Eye Center to breathe and be fully present, sharing lunch with someone whom I feel a strong connection, or simply coming home and being aware of how I am feeling in the moment. I invite clients to begin to write letters of self-compassion to themselves. They may say – you want me to do what? I want you to take a few moments and write a letter to yourself. Look at yourself and your struggles from a place of empathy and self-compassion and see what comes. I am amazed at the wisdom, love, and encouraging words that come from our heart to ourselves when we stop to listen and love. One day I invited a teen client to do this exercise. She was dealing with a lot of anxiety and was beating herself up for missing some days of school during this time. I invited her to write a letter of self-compassion. I gently explained the concept of self-compassion again. I invited her to try again. This time, she understood and wrote an encouraging letter to herself – acknowledging her pain, her efforts to get to school, others also experienced anxiety and she could do it. I asked her which letter was going to help her be motivated to get to school tomorrow with a lot of enthusiasm she said,the self-compassion letter. We tore the negative, beat self up letter. She kept the compassionate letter to encourage her to keep trying and moving forward with self-kindness, common humanity, and mindfulness. Write a letter of self-compassion to yourself. Find a nice quiet place where you can be uninterrupted as you take a few moments to reflect on what you are experiencing. Then, take out the pen and start … Dear ________. As I have done this with clients I am inspired by the human spirit and what is in our heart. On a deep level we want to cheer ourselves on and believe in ourselves. We also have kindness and compassion for ourselves. Nurture a talent or skill. When we take time for ourselves to invest in something we want to learn, our self-worth increases. We also light our divine spark and gain energy. This not only helps us in our journey but those around us. Savor moments. Take time to really cherish the moment. Find healthy and positive ways to assert yourself each day. Help someone else. As we authentically give we bless lives and feel better about ourselves in the process. Change your critical self-talk. Take some time to notice what you are saying to yourself. Make an active effort to soften the self-critical voice with compassion not self-judgment. When we are critical to ourselves we are causing ourselves unnecessary pain. Reframe the observations made by your inner critic in a kind, friendly positive way. Visual and then create a Nurturing Basket. What would you put in your basket of nurturing activities for yourself? Mindfulness and Self-Compassion, Christopher Germer, Ph.D.
Self-Compassion: The Proven Power of being kind to yourself, Kristen Neff, Ph.D.
Becky Andrews, is a Licensed Clinical Mental Health Counselor, Author, and Motivational Speaker. She recently qualified for the second time to run the Boston Marathon. When she is not working or running, you’ll often find her on the back of the tandem bike with her husband, Steve. Becky is blind from Retinitis Pigmentosa and is with her third guide dog, Georgina. You can reach Becky at lookupmoveforward@gmail.com, www.resilientsolutionsinc.com/look-up-move-forward and Facebook Becky Andrews. Tags: Becky Andrews, Look Up Move Forward, Resilient Solutions Inc.